Sophomore middie Owen Larson scored two goals, including an insurance goal late in the fourth quarter, and won 10 of 14 face-offs on a wet and drizzly Tuesday night, helping No. 10 Chaminade hold off a strong second-half rally by No. 11 Crespi to win 11-9 in a Mission League game. 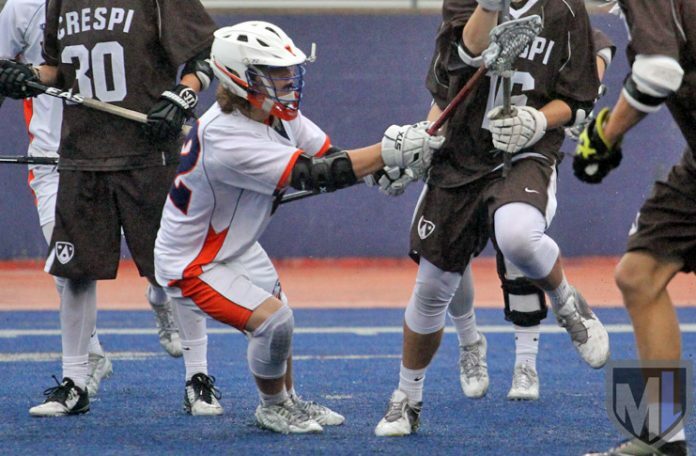 Junior Thomas Nelson led Chaminade (4-3, 2-1) with three goals, and Larson, Max Kim and Nino Leone scored two each. Mac Griffin and Trevor Roberts each scored once. Leone, Griffin and Roberts each had two assists, and Kim had one. Sophomore Logan Soelberg led all scorers with five goals for the Celts (4-3, 1-2), and Jake Milkovich scored three and had one assist. Ryan Milkovich scored once. Crespi was playing without starting attackman Bradley Barberie, injured last week against St. Francis, and is still missing senior attack Robert Clapper, who was injured in the season opener against Agoura. Playing with a juggled lineup, the Celts were out of sorts in the first quarter, committing multiple turnovers and struggling to clear the ball. Crespi took one shot in the first 12 minutes, hitting pipe. Chaminade, meanwhile, steadily built a lead, capitalizing on the extra possessions granted by Crespi’s mistakes to lead 5-0 after the first quarter and 6-0 just 19 seconds into the second period. Five different players scored for the Eagles during that stretch. Crespi came alive finally, getting two goals each from Soelberg and Jake Milkovich in a three-minute span to pull within 6-4. It stayed that way until halftime. The Eagles led 9-6 entering the fourth quarter, but the Celts kept chipping away. Jake Milkovich’s third goal made it 9-7 with 6:21 to play, and Soelberg pulled Crespi within one at 9-8 at the three-minute mark. But Nelson scored quickly off the ensuing face to restore Chaminade’s two-goal lead, and Larson did the same off the next face, putting the Eagles up 11-8 with 2:24 left. Soelberg’s final goal with 1:31 left added a bit of drama to the final 90 seconds, but Crespi couldn’t get any closer. The Celts outscored the Eagles 9-5 after spotting them the 6-0 lead, but Chaminade did just enough to hold off the Celts’ rally. Goalie Nico Rabushka made six of his eight saves after halftime; Larson and Kim won seven of nine second-half face-offs; and the Eagles found the net when they needed to, never surrendering the lead. Chaminade plays at home Friday against St. Francis. Crespi travels to Damien (La Verne) for a nonleague game on Thursday, then is home against Notre Dame on Saturday.